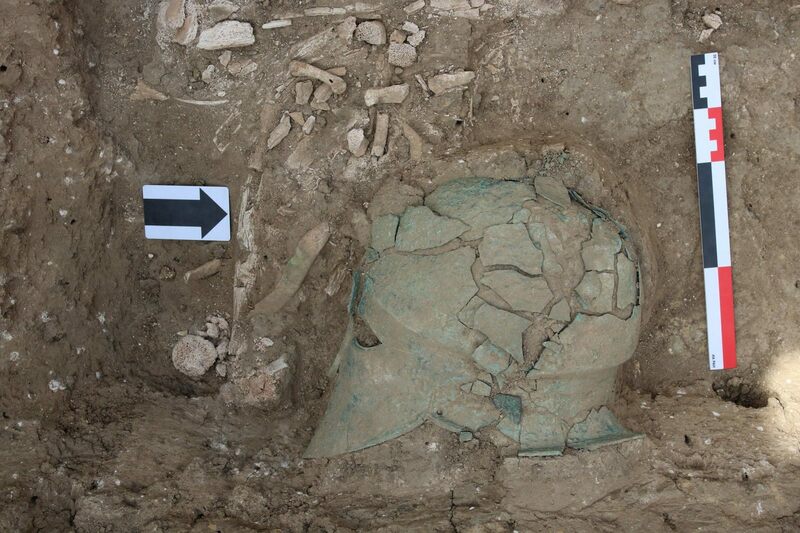 Archaeologists have unearthed an ancient Corinthian helmet in a grave on the Taman Peninsula in southwest Russia on the north shores of the Black Sea. The helmet is fragmented and corroded, but its face plate, even buried on its side, is instantly recognizable as the iconic emblem of Greek warriors from Athena to Pericles. This is a Corinthian helmet of the “Hermione” group which dates it to the first quarter of the 5th century B.C. Initially, these helmets completely covered the head and looked like a bucket with slots for the eyes. The helmet completely protected the head, but limited the view to the sides, so it is believed that the warriors in such helmets, as a rule, fought in the phalanx and the warrior did not need to follow the movements of the enemy from the side. Later helmets began to be done so that the soldier had the opportunity to raise the helmet and slide back. The northern coast of the Black Sea was colonized by Greek settlers who, starting in the 7th and 6th centuries B.C., built a series of independent polities along the coastline. By the 5th century B.C., the cities were part of the Bosporan Kingdom, a Hellenistic kingdom ruled by two successive dynasties until it became a Roman client state in the 1st century B.C. 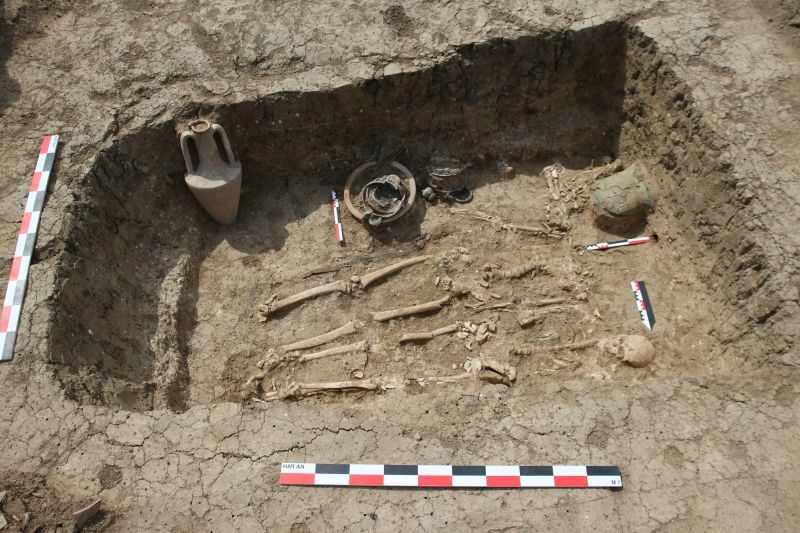 The Institute of Archaeology of the Russian Academy of Sciences (IA RAS) has been excavating a late Bronze Age necropolis two miles outside the village of Volna for three years. It contains about 600 burial mounds (kurgans), making it unusually large for the period and area. Many of the kurgans in the necropolis hold the remains of Bosporan noblemen and warriors. More of them have been unearthed in the 2018 dig season. The team discovered multiple graves of cavalrymen on the edge of the necropolis just outside its boundaries. The warriors are buried with their weapons and their bridled horses. They are believed to do date to the same time and were likely all interred as part of the same funerary rite towards the end of the 5th century B.C. It’s the Corinthian helmet that caused the greatest stir, however, because it is only the second such helmet found within the boundaries of the former Russian Empire; the other was discovered in a burial mount near the village of Romeykovka, Kiev province, in the 19th century. 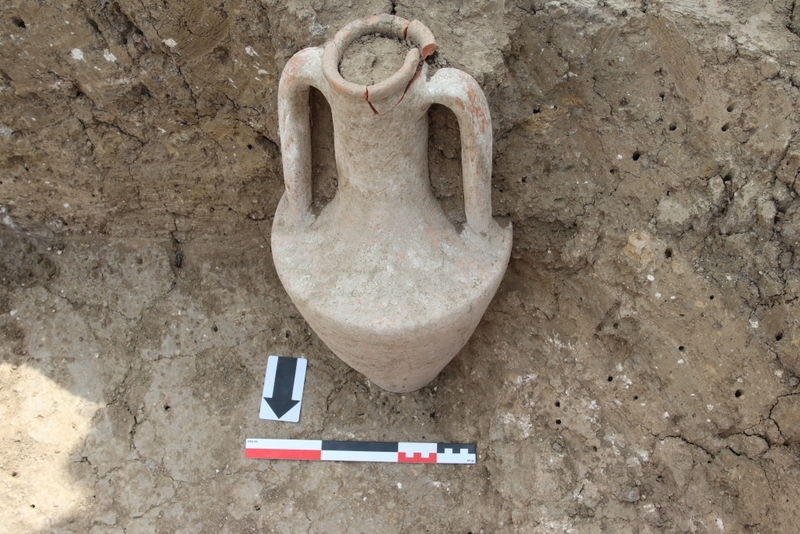 None have been found in the Greek colonies on the northern coast of the Black Sea, although sculptural representations of them have, as have numerous other artifacts imported from Greece, both high value and quotidian. Helmets of any type are rare finds, the kind of thing only high-ranking warriors would have been buried with. Head of the Department of Classical Archeology IA RAS Vladimir Kuznetsov believes that the helmet indicates the social status of the warrior. “Apparently, this is a warrior who died in the battle and was buried not in his native city, but near the place of his death. That’s why the grave is not a crypt, but a simple burial. The helmet testifies to his status as a full-fledged citizen of some kind of polis, most likely one of the Bosporan cities, and also about a certain level of well-being, “Vladimir Kuznetsov said. This entry was posted on Monday, May 28th, 2018 at 12:50 AM	and is filed under Ancient. You can follow any responses to this entry through the RSS 2.0 feed. You can skip to the end and leave a response. Pinging is currently not allowed. Interesting find. To me, that amphora (whatever the content) looks “Greek”. The grave is actually a ‘joint cavalry warrior grave’ (“Общий вид захоронения воина-всадника”?) with seemingly two “warriors” -and indeed only one helmet. Thus, if only one of them was a horseman, the helmet was obviously used by the other one. Notably, there were Greek colonists, mercenaries, Scythians, Persians against Scythians, Greeks against Persians …and even female warriors. “[…] At a yearly festival […] their maidens take their stand in two parties and fight against one another with stones and staves, and they say that in doing so they are fulfilling the rites handed down by their fathers […] all join together and equip the maiden who is judged to be the fairest on each occasion, with a Corinthian helmet and with full Hellenic armour, and then causing her to go up into a chariot they conduct her round the lake. […].” –Herodotus’ Histories, Bk. 4, 180.